One of the first things I noticed when I got my Treo 650, was that it did not come with the Note Pad application. That was quite annoying as I had several Notes on my old Palm IIIxe that I would have liked to bring across to my new toy. A further check revealed the Expense application was also missing, which wasn't a problem as I never used it. What I was also looking for was a voice recorder application. I had thought that SoundRec was going to be the answer, until I found a web forum message that mentioned transferring the missing applications from a LifeDrive or Tungsten to the Treo, including the Palm Voice Memo application. I'd much rather stick with official Palm applications, mostly for compatibility with fellow Palm users (eg, transferring my Palm IIIxe Notes to my Treo). That got me thinking. I'd recently joined the Palm PluggedIn program and downloaded the new SDK and Treo simulators. I checked and there were some LifeDrive simulators and Desktop software available. That's all that's needed. These instructions describe how to get the Expense, Note Pad, and Voice Memo Palm applications and corresponding Windows Desktop sync support files from a LifeDrive installation to a Treo. It is quite likely you could just use a LifeDrive Desktop installation instead of the Treo one, but I prefer to keep system changes to a bare minimum and have detailed how to modify an existing Treo Desktop installation with the LifeDrive files. Besides, I use VMware so I could temporarily install the LifeDrive software on a dedicated virtual machine, transfer the required files to my real installation, then restore my virtual machine to its pristine state. Make a backup of my existing Palm data that's on my PC, just in case. Uninstall my Treo desktop software and install the LifeDrive version. Follow my instructions below to find the required conduit files and make the various registry files. I'd make copies of all the various files and keep them in a safe place. That way, if I ever need to re-install my Treo software in the future (eg on a new computer), I won't need to mess around with the LifeDrive software again. Uninstall the LifeDrive software, and reinstall my Treo software. Before doing anything with the LifeDrive files, check and make sure all the Treo software is working, synchronizing, etc, and that no data has been lost. You did make backups earlier, right? Make the required modifications to the registry files as described below, to have them match up with the Treo desktop software settings. Copy the various LifeDrive files to their correct locations, install the registry settings, and register the OCX files. Please, do not contact me requesting copies of the files. They are copyright by PalmOne and I will not redistribute them. Requests for files will be immediately trashed. Register with the Palm PluggedIn Program. Go to the LifeDrive section and download the Release Simulator and PC Desktop software. Unzip the Desktop software and run the setup.exe file to install it. Unzip the Simulator software. Run the PalmSim.exe file to run it. Right-click on the Simulator then select Settings, Communication, Redirect NetLib Calls to Host TCP/IP. Extract Filez.prc from the Filez zip and drag-and-drop it onto the running Simulator to install it in the Simulator. †The Compression files as found on the LifeDrive may not be suitable. They are about 100B, while files more like 40KB are probably required. The 40KB files are available from this TreoCentral web forum post. 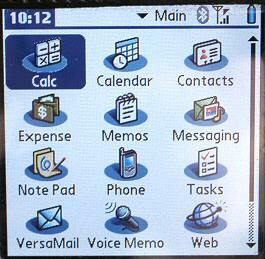 Open the Palm Desktop. Select Custom from the HotSync menu. Set the LifeDrive Manager conduit to Synchronize and Backup. Right-click on the HotSync icon in the SysTray and make sure Network is ticked. Start the HotSync application on the Simulator. Tap Network. Select Modem Sync Prefs from the Options menu. Tap Network. Tap OK. Select LANSync Prefs from the Options menu. Tap LANSync. Tap OK. Select Primary PC Setup from the Options menu. Enter 127.0.0.1 as the Primary PC Address. Tap OK. Tap the HotSync button. The Palm files will be found in: C:\Program Files\palmOne\<your HotSync name>\Internal Drive Backup\Documents. They cannot be installed via HotSync. The files must be transferred to an SD card, then copied directly into the Internal memory. Card Export II can be used to copy the files to the SD card. Use Filez to copy the files from the SD card into the Internal memory. Go to Start > Run and run "regedit". Go to "HKEY_CURRENT_USER\Software\U.S. Robotics\Pilot Desktop". Export the "Expense" branch as "Expense.reg". Export the "Memo Pad" branch as "Memo Pad.reg". Export the "Expense" branch as "Expense Extension.reg". Export the "Notepad" branch as "Note Pad Extension.reg". Export the "Voicepad" branch as "Voice Memo Extension.reg". You will need to check the "* Component.reg" files so that the components on the destination system will be numbered from zero with no gaps (may not be necessary, but probably safest). Open regedit on the destination system to see what, if any, components are already present in the registry. You may also need to edit the "* Extension.reg" files if the destination Palm Desktop software was installed in a different folder from the source Palm Desktop software - fix the folder names as appropriate. Assuming the *.reg files have all been edited as necessary for the destination system (see above), double-click on each to install. Last updated: 2005-08-19. Copyright © 1999-2019.